I think people are too competitive and not collaborative enough. Sometimes, after I’ve repetitively thought about it numerous times, I find that an idea just resonates and I find myself referencing it again and again. I like to reference this idea with this quote: “I think one of the major mistakes of education is teaching children that everything is a competition instead of a collaboration.” And since I rarely I have time to expand upon or defend this idea in conversation I’d like to try and do so in this quick essay. I play quite a bit of tennis and golf nowadays. If you ever want to see grown adults acting like children, just try getting involved in one of those sports at an amateur tournament. 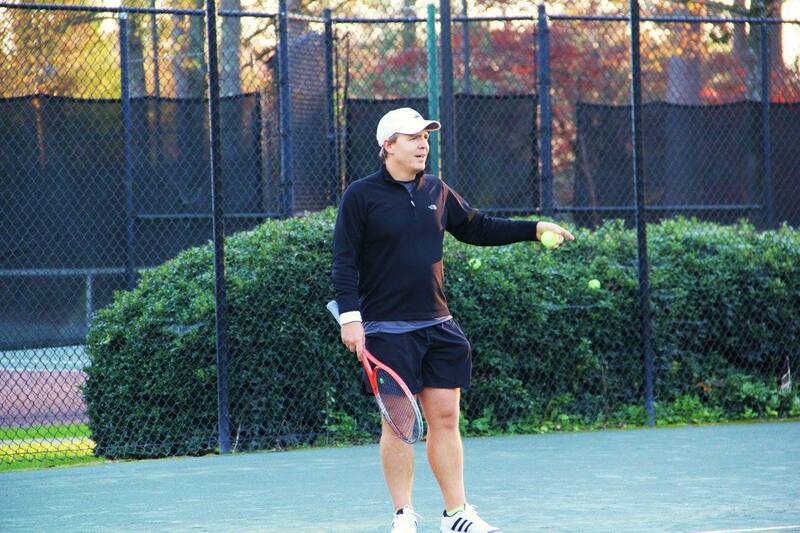 In the picture above, it looks like I’m asking about a line call during a local tennis round robin. Since the line calls are made by the players in amateur tennis, it’s easy to make both honest and dishonest mistakes when a tennis ball is moving at eighty plus miles per hour. Likewise, aside from the knock of a bad ball lie, amateur golf involves a handicap rating set by the scores turned in by the players which are often ‘cherry picked’ to benefit the players handicap. Anytime I travel to a tournament, I’m inevitably confronted by some of this behavior. I’ve found that competition in business is no different a scenario excepting that the conflict of business competition can be litigious rather than just bad sportsmanship. The field in which I work is one in which collaboration is typically exemplified and competition is only more subtlety built into the codebase of the software. I got an email from a fella in Belarus the other day asking to help fix an issue with a project I’d built. This fella could have just copied it and republished it as his own, but he understood the value of collaboration and offered to assist my project in fixing bugs. Many times I’ve had a business and another developer simultaneously contact me about working on the same project. I prefer not to see other developers as competition since each of us usually has our own strengths and over the years, I’ve learned that it’s unwise to create more competitors than cohorts. I always try to offer to assistance with projects in such a way that everyone wins. And while I don’t always pocket the majority of the money, I let the other businesses play to their strengths and I get to keep to mine while building alliances and not enemies. I believe the only way to undo this sorta competitive mentality is with education. I’ve worked for both a school district and university where I could witness this first hand. The university banners around campus spoke much louder than the actions of the academic committees on which I served. Whoever the printing company that handled the football merchandising was making a mint. In the primary school district, I think there is definitely an effort to teach collaboration between students. But while collaboration is being taught, I think the overall lesson that seeps through to the students is that of test scores, athletic performance, and college acceptance rates… kinda the ‘real world’ is tough and life’s not fair mentality. And while I agree partially with the mentality and I and can see where it might help others succeed, I found that it’s a finite balancing act in which the majority of my successes in the ‘real world’ have been through collaborations and not competitions. I recently saw some sort of sports is life metaphor poster. I don’t even remember where it was or what sport because I’ve seen so many and there are literally thousands of sports life metaphors out there. Regardless, it always reminds me how much people tend to lean towards the life is competitive notion. And as much truth is in them, I think competing just to survive is something that no human should have to endure since we have the resources capable of sustaining the existing life on this planet. I think most modern democratic societies try to echo this same opinion in their laws. However, it’s entirely evident that in our current political climate, these polarized competitive opinions are being exemplified by many of our candidates and I think that’s merely a reflection of the general population. I believe it’s ever so important that this atmosphere of competition is quieted down a bit and I can’t help but reflect on the fall of the Roman Empire and this same gushing glorification of competition. At this point, you might want to pigeonhole my thinking, but I do believe that competition is an important and healthy aspect of not only our society as a whole, but of our personalities and not just in a Darwinian sense. And while I cannot help but notice in conversation the one-upmanship of our competitive nature, I also try to recognize our compassionate and caring nature. Just this week, I had a conversation with my wife about medical responsibility in which I defended the rights of hospitals and doctors to compete and set their own rates because I believe that competition increases the levels their services. This same argument can apply to any number of differing practices and scenarios. Personally I’ve found that I like to challenge myself to little competitions to see if I can accomplish tasks and I’ve found this greatly increases the likelihood of doing so. It’s not different in any other arena and I believe it’s healthy to challenge one another in that same sense. Some of the greatest accomplishments of mankind have occurred under the guise of friendly competition. But what are the consequences of competition and why do I think that collaboration more important than ever? We are living with an ever increasing population in an ever shrinking world. And while war and conflict are sometimes relevant competing forces, the consequences of global concerns, like climate change, are shared responsibilities that will no longer pit the competition of one country versus another. Likewise, our economies are so intertwined as to merit cooperation on the part of nations. The divides between us are getting smaller in the sense that information, and thus money and resources, travel at the speed of light. So what is an appropriate balance? I believe that there are certain aspects of our cultures that could simply forgo the competition. I don’t believe we should be an arms race with medicines and genetics. I don’t believe that any nation or corporation should be competing to acquire any of the finite resources of this planet. I might suggest that in some areas we should drop our competitive nature and start thinking more collaboratively. And as for now, I’d like to try and keep most of my competition confined to sport on the court and courses and do my best to act like a gentleman while doing so.